Ted: I look like Snuggles' accountant. I laughed a lot during Ted. It sits next to 21 Jumps Street for me, currently, as the best pure comedy of 2012. It is a high-concept comedy that could have easily worn itself out, coming off more as an extended Saturday Night Live sketch, but it doesn’t. 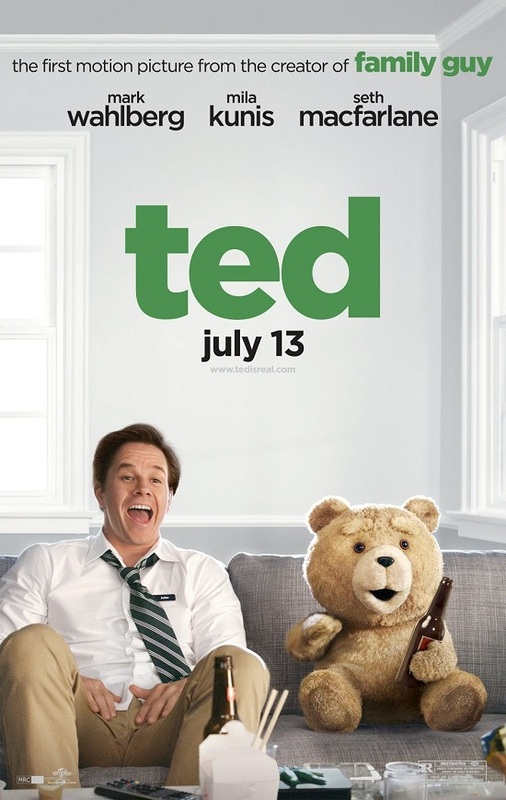 Ted, while profane and raunchy at times, also bothers to give a damn about its characters, which results in a film that is fun to watch, for sure, but also has enough heart and actual respect for the people involved that it works quite well as a film. It should come as no surprise that the movie features plenty of filthy and offensive jokes, but the real shocker should be the amount of care that went into making the lead characters likable. Also, bears are funny. The story begins with the most unpopular kid in the neighborhood wishing for something very special. Having received a large teddy bear as a Christmas gift, he spends enough time with it to wish it could come to life and be his friend forever. This wish comes true and after dealing with the shock of seeing a teddy bear come to life, the two continue on with their friendship into adulthood. As adults, John (Mark Wahlberg) and Ted (voiced by writer/director Seth MacFarlane) are basically slackers. Despite receiving fame for being a living teddy bear, Ted never did much but hang around and get stoned with his pal. John is a little dim, but well-meaning guy, who at least found love in not just his best friend, but also his girlfriend Lori (Mila Kunis), who he’s been seeing for four years. The plot never really becomes that complex and is the weakest aspect of the film, mainly because it has plenty of other aspects to cover and mine for comedic material. Ted is essentially the third wheel in John and Lori’s relationship, with Lori believing Ted to be holding John back from really becoming an adult. They are all forced to work out their living situation, which will bring about conflict within their relationships. There is also a subplot involving Giovanni Ribisi as an adult who grew up wishing he could have a Ted of his very own. Still, it is really just about delivering on the humor. 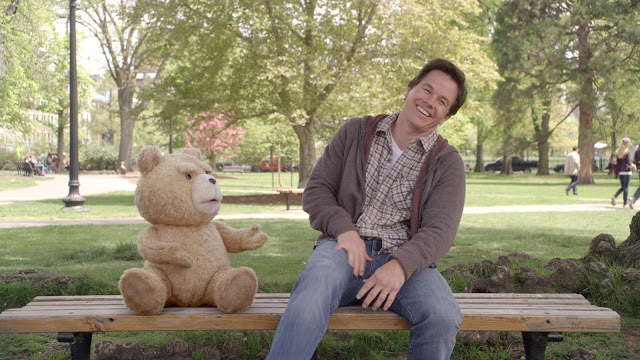 Without a doubt, the best scenes of this film simply involve Wahlberg and Ted hanging out together. It helps that the CG creation of Ted is quite good and I was never taken out of the picture because of him (regardless of how close it sounds to Peter Griffin on Family Guy), but I found the relaxed chemistry between the two to be quite effective. The two move between various conversations, arguments, and challenges of sorts and I also found there to be true brotherly love in a relationship between a man and his stuffed teddy bear. Wahlberg has shown in the past that he is quite capable as a comedic actor and that continues to payoff here. He seems to know how to make fun of himself and gets a good amount of material to make for a very affable guy. MacFarlane’s vocal work as Ted is strong as well, with a plethora of dirty/offensive jokes constantly being delivered, but never in a manner that is mean-spirited. I have a lot of praise for the fact that, while very R-rated, the film is quite sweet-natured in its overall intent. Given that the film is about having a third wheel in a relationship, it was nice to find that the film didn’t vilify anyone, really. In a lesser script, Kunis could have come off as a shrewish character, but Ted places her as the person whose side we are on. Similarly, Ted could have been made to be the bad guy in this situation, but the film actually bothers to have he and John have real conversations that point out irresponsible choices they have made. There’s a lot of material involving Joel McHale’s supporting role as Lori’s boss that I could have done without, but even the intent of those scenes works quite well for this film. Ted marks the feature film debut of Seth MacFarlane as a writer and director. He was joined on the screenplay by Family Guy writers Alec Sulkin and Wellesley Wild. There are plenty of other associations with Family Guy as well, including various cameos and members of the cast, the music done by Walter Murphy, and even the New England setting (Boston in this film, as opposed to Quahog). In recent years I have not watched Family Guy, but I certainly recognize a lot of this film as essentially being the closest anyone will come to making a live-action Family Guy movie. That only applies to some extent though, because Ted does something that is closer to how the golden era of The Simpsons played out, which is by having heart. While Family Guy sometimes adds a little extra to what it is going for in the emotion department, it tends to be a fairly mean-spirited show. Ted works well as a dirty comedy with great one-liners and cutaway gags, but I also really enjoyed the undercurrent of respect it had for its characters (even Ribisi’s creepy character just wanted to provide an entertaining toy for his son). There is a lot of fun to be had with Ted. It fits the bill of being an R-rated gag-fest, but it has plenty of sharp material as well, with a core concept that doesn’t get worn out. One can argue about the perfunctory nature of the plot, but it worked well enough in getting the characters where they needed to be (with the aid of a few great cameos in the process). It also certainly helps that Wahlberg and Kunis are funny in their own right and not just around for Ted to bounce jokes off of. The film has plenty of good jokes, but also finds the time for empathy, making it a comedy that will have one laughing (depending on their tastes of course), but not feel like the characters in the film were jerks or not well enough defined. It also proves that apache helicopters are awesome. Ted: Lori, hey, you're home early. Lori: This place is a wreck! Who are these girls? Ted: Y'know, they're hookers. So it's fine. Lori: What the hell is this? Ted: Oh, where are my manners? Lori, this is Angelique, Heavenly, Charene, and Sauvignon Blanc. I love you girls. Y'know, somewhere out there are four terrible fathers I wish I could thank for this great night!